We recognise that you, our readers, are more on the move than ever and want to travel light. So we’ve downsized the magazine format, but upsized the content, with articles and features that fit in perfectly with your busy lifestyle. 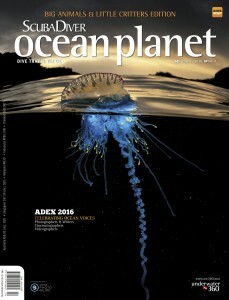 Whether you’re on your morning commute or on the way to your next dive destination, the new SD OCEAN PLANET is the handy little magazine to have with you! We’ve got a year of awesome themed issues planned for you, and what better theme for this first issue than “big and small”? In our expansive central feature, “Big Animals and Little Critters”, starting on page 65, we bring you face to face with the largest and the smallest in our compilation of 20 of the planet’s most exciting dive destinations. As well as a totally new design, the magazine includes great new sections, in addition to old favourites. Our dedicated photography section, Through The Lens, now includes the new Underwater Photographer’s Guide (page 108), this time devoted to Indonesia’s incomparable Raja Ampat – a mind-blowing destination for encounters with all creatures great and small. And when it comes to big, it doesn’t get much bigger than the largest (and longest-running) dive expo in Asia: ADEX 2016. In this issue, we give you a full rundown of the event’s highlights, including the amazing Photo Video Speakers, the Film Festival programme, and our all-new Book Festival. We hope you enjoy the new magazine! Laurent Ballesta and his team unravel the mystery of the grouper spawning aggregation in French Polynesia. We talk to Shawn Heinrichs, part of the team behind the call-to-action documentary screening at the ADEX Film Festival. 20 top destinations around the world to encounter some of the ocean’s largest and smallest animals. Discover 11 of the top critters from the Coral Triangle that should be on every diver’s bucket list. Near Korea’s popular Jeju Island is a tiny gem that makes the perfect weekend getaway for divers of all levels. Everything you need to know about the fantastical underwater world of Raja Ampat. Laura Waters has her images scrutinised by pro photographers Joseph Tepper and Lia Barrett. A short hop from Manila, Puerto Galera is a dive hotspot among the best in the Philippines. Head to one of the Philippines’ hottest dive spots for great critter, reef and wall dives – and savour the area’s laid-back topside activities.